I decided to come back to this exercise after taking a lot of other Skillshare classes on illustration. It's really a good exercise to come back to something after gaining some practice. Never, never, ever stop drawing, learning and practicing it's the only way to evolve and get better. I have never received a brief before and as my mother tongue is not English, this class was a great exercise for me. I could never imagined all of the questions that you should ask before saying yes. I learned a lot from Lisa an from my wonderful peers e-mails, without you I would never come up with this e-mail. This is one of the illustrations that she saw in my portfolio that made her contact me. I'm delighted with your offer. I admire the work your publish company is doing and I'm honoured to be given the opportunity to be part of your history with my pinhões shaped pigs. To make sure we can work together in this amazing project I need to know more about the briefing. You wrote that the deadline is next month, but didn't precise the day? You said that this version is going to be different and I would like to know what do you have in mind when you say different. What is the file format you will need? Is the book going to be on a digital format or is going to be printed or both? Do you have any colors that I should avoid using? Are you working with a graphic designer? How many illustrations do you need and for what parts of the story they are for? Do you want some handwriten words for those illustrations either? What are the sizes of the illustrations. What is the fee and how is the payment going to be scheduled? Thanks again for thinking about me for this illustration work. Thank you for the clarifications. I'm happy we can go on with this project. Attached to this e-mail you will find the two roughs. As the Atlantic rainforest is in danger and is the nature I grow up surrounded by it was important for me to convince the editor that the story of the three little pigs had to be there. This is my tiny contribution to try to save this amazing piece of nature. In this domain Sebastião Salgado did an incredible job at Instituro Terra. If you don't know it I encourage you to discover it. 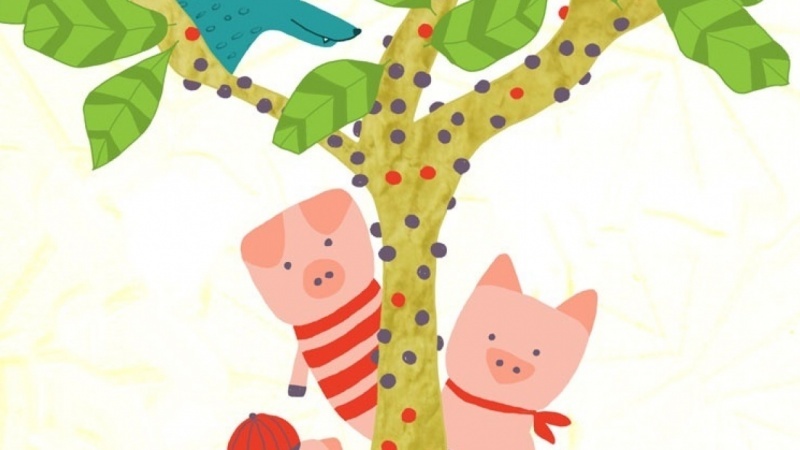 Here is the Story of Three little Pigs in the Atlantic Rainforest final art.